Like its apple and pear relatives, the quince tree (Cydonia oblonga) originated in Central Asia. The fruit resemble very firm, bright green, short-necked pears. Quince is known for its distinctive floral aroma, but the raw fruit is rarely eaten because it is astringent, sour and gritty, even when ripe. Quince is suitable for many cooked preparations and will turn reddish-pink when cooked. Membrillo, a firm paste made of cooked quince, is a traditional accompaniment to Spanish Manchego cheese. 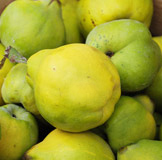 Quince can also be used for jams and jellies, as in the Portuguese quince jam known as marmalada. A few quince slices added to apple pie lend a fragrant, perfumed flavor. Look for quince from September through November. Quinces are a very good source of vitamin C, a powerful antioxidant that supports both immune system and cardiovascular health. Pick quinces that are full-yellow and firm. Quinces must be handled carefully, as they bruise easily.